Ginger is an amazing remedy for nausea, motion sickness, an upset stomach, inflammation, headaches, cramps, gas, and bloating. Fresh ginger can have a bit of a bite to it, so it’s often an acquired taste for children and those with sensitive palates; but this recipe is a great way to ease into enjoying fresh ginger. Traditional candied ginger recipes are loaded with refined sugar, and some also contain preservatives. Instead, this homemade candied ginger recipe uses maple syrup as an alternative sweetener. If you like the slight crunch from the sugar in traditional candied ginger, you can also choose to add a bit of coconut sugar to this recipe as well. 1. Peel ginger and slice evenly. Add ginger, water, and maple syrup to a medium pot and bring to a boil, reducing to a simmer. 2. Cover and let simmer for 30 minutes. Remove lid and let simmer on low heat for an additional 30 minutes, until ginger is quite tender. (The liquid syrup should also be reduced.) Remove from heat and let cool. 3. Strain out pieces of ginger (reserving the liquid). 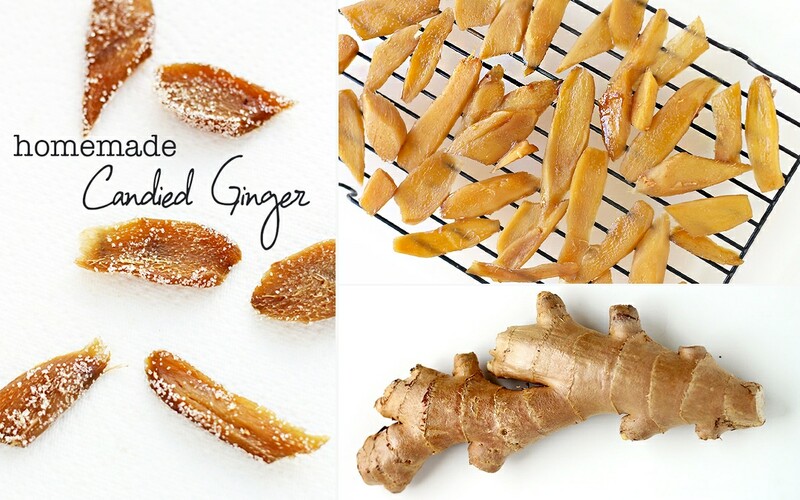 Lay the ginger pieces flat on a wire rack or piece of parchment paper. 4. Sprinkle optional coconut sugar over the ginger pieces. 6. Transfer to an airtight container and store in the refrigerator for up to two weeks.